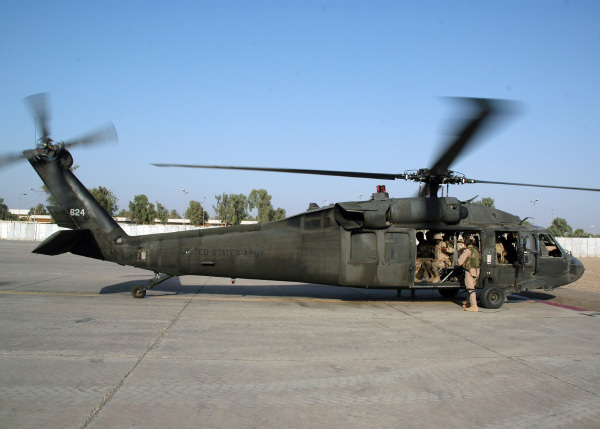 The UH-60 Black Hawk is a four-bladed, twin-engine, medium-lift utility helicopter manufactured by Sikorsky Aircraft. Sikorsky submitted the S-70 design for the United States Army's Utility Tactical Transport Aircraft System (UTTAS) competition in 1972. The Army designated the prototype as the YUH-60A and selected the Black Hawk as the winner of the program in 1976, after a fly-off competition with the Boeing Vertol YUH-61. The UH-60A entered service with the Army in 1979, to replace the UH-1 Iroquois as the Army's tactical transport helicopter. Two Lycoming T55-GA-712 turboshaft, 3,750 hp (2,796 kW). M240 7.62 mm (0.308 in) machine gun.